The wait is over! The highly anticipated Holiday and Celebration Bread in Five Minutes a Day cookbook is now available! Fun fact: all recipes are tested with Red Star Yeast! 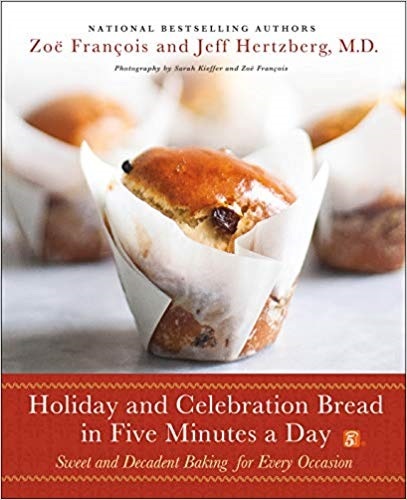 From the authors of the Artisan Bread in Five Minutes a Day series comes a holiday and celebration cookbook that uses the same groundbreaking quick and easy baking method. Zoë François and Jeff Hertzberg shocked the baking world when they proved that homemade yeast dough could be stored in the refrigerator to use whenever you need it. Now, they’ve done it again with Holiday and Celebration Bread in Five Minutes a Day, a cookbook with savory, sweet, healthy, and decadent recipes for every occasion. Every culture has its great bread traditions for holidays and celebrations―traditional Christmas loaves from Ukraine, Greece, Germany, Italy and Scandinavia; celebration breads from France and Israel; Easter breads from the United Kingdom, Sweden, and Austria to name a few. The book is chock-full of fragrant, yeasted treats made for celebrations and special occasions. All the old standbys are here, plus delicious examples from around the world. All were too time-consuming and painstaking to make at home―until now. In 100 clear and concise recipes that build on the successful formula of their bestselling series, Holiday and Celebration Bread will adapt their ingenious approach for high-moisture stored dough to a collection of breads from the four corners of the globe. This beautiful cookbook has color photos of every bread and includes step-by-step collages. With Zoë and Jeff’s help, you’ll be creating breads that rival those of the finest bakeries in the world―with just five minutes a day of active preparation time. We’re giving away one (1) cookbook to three (3) randomly chosen winners. Enter (USA and Canada addresses only) using the Rafflecopter widget below. I received my cookbook that I won (Holiday & Celebration Bread in Five Minutes a Day) …. as well as a wonderful calendar and an envelope of Red Star Yeast to get me started!!! The book looks GREAT!! I’ve been so busy with holiday tasks that I haven’t had a chnace to look at it yet ….. but, I will surely be using it after the hholiday rush as I love to make bread!! Thanks again and have a wonderful holiday season!!! I just found out I’m one of the winners!! I thank you for this opportunity and I can’t wait to start baking bread!!!!! I’d love to make savory yeast rolls like my great-aunt who recently passed away. I want to learn to make yeast bread. I love to bake and cook, I collect all cookbooks. Would love to add this to my Minnesota authors. Cinnamon rolls for me! I love making these around the holidays! I want to make Sweet Yeast Rolls. I love them during the holidays. I’d like to bake sweet and savory rolls!! This book looks amazing!! Would like a caramel roll recipe. Recently, I realized that of all the cooking I do I love baking the best. In particular, I enjoy making Holiday cookies and breads to share with friends and family. I’m also always looking for new items to add to my repertoire. Cinnamon Rolls, Cinnamon Bread, anything yeast with cinnamon. I just love that spice during the holidays. Moravian Cake, an oldie but goodie. Been making it since I learned to bake in the early 1950’s. My Mom taught me. A great favorite of hers. It always means home and holidays to me. Terrific recipes — definitely bookmarking these. I’m going to make the Apple Crisp Sweet Roll Coffee Cakes for Christmas Brunch. Sour dough bread and chocolate swirl sweet rolls. One of my husband’s favorite things is bread, not out of the oven. I would love to be able to whip up bread more often. If I win I’ll start experimenting. I’m in the mood for Sally Lunn. I used to make it all the time for the holidays. I want to bake so Bear Claws. The ones that have the thick, tasty filling that gives a satisfied smile with every bit. Most are to stingy with the filling and I miss the ones with the more generous filling. So yep, that is what yeast bread I want to make. Happy Holidays. I agree!! The only place I had really good bear claws was in the Flamingo hotel’s breakfast buffet in Las Vegas. Everywhere else you barely get filling. I’ll have to start making my own. I can’t wait to try Pumpkin Pull Apart Bread – it looks SO yummy! I’D like to make some yeasted Waffles (Liege Waffles) for the holidays and also some Cinnamon Rolls too! I’ll have more time for the rising when the school Winter Break is on! My grandkids love cinnamon rolls; but I’s love to branch out into some other things. I love red star yeast because it has never failed to work in any receipt i make. sometimes it is hard to find where i live. I’m not sure yet but definitely something with Cranberry. Whole wheat bread and cinnamon rolls are my families favorite! I would love to make a chocolate bread this holiday season. I want to make dinner rolls for Thanksgiving. My family loves homemade bread. It would be wonderful to add a new cookbook to our house! I would love to make homemade yeast rolls for my holiday table. Is there an option for a digital copy? While I would love a print version to share with my daughters (they’ll have to figure out who gets custody of my print-version cookbooks during what months of the year), I’m not able to read printed materials anymore. At present, I still have light perception but not clarity. It’s like seeing through a straw with Saran wrap taped to the ends. Hi Samantha – there is not a digital version of the Artisan Bread in Five Minutes a Day book. However, we do have a digital ebook that you can download: https://redstaryeast.com/bake-up-a-smile-ebook/. Homemade cinnamon rolls are great! The yeast bread I am most looking forward to making are my garlic knots. I make them only on holidays! I think I’ll try a monkey bread from scratch this year or yeast sweet bread with fruit! My holiday baking includes kolaczki(small fruit/nut pastries), poppyseed & nut rolls. Maybe even babka but that’s usually at Easter. Thanks for the chance to enter! I love making the peasant bread all the time, but I can’t wait to make the chocolate muffins for the holidays. Also have always wanted to try a star shaped bread. Hope to get some baking in..my work schedule changed so I don’t have afternoons free anymore …Love to bake…used to watch my Grandma Benson Knead the dough she worked in on her Bread Board..Made the Best Buns (big as your hand)and loaves of Golden Bread. Looking forward to experimenting more with my breads over the holidays, especially with my family skl together this year! I am looking forward to experimenting more with my bread making, and really getting creative over the holidays! Love breads all kinds but I want to make your Pumpkin Cheesecake Braid. I want to also make some yummy crusty breads, they make your house smell so much like the bakery I used to work at. There are so many new recipes I can’t wait to bake for the holiday seasons both Thanksgiving and Christmas. I do bake a lot at these holidays homemade gifts everyone loves to receive. I do breads and candy of course. Pumpkin Challah is on the list……..yum. I will be making your pumpkin spice latte cinnamon rolls rolls and the pumpkin spice sugar donuts. Look and sound delicious. I would love to make some sweet yeast rolls! Definitely bread. Then I would like try some new desserts instead of the old standbys. Any yeast bread will make an inviting fragrance when it bakes on Christmas morning. I would like recipes that can be made ahead and baked and brought to the table warm. The sugar and spices and fruits of the season will add to the appeal of the feast. Interested in any type of egg breads or fruit breads. … and a happy holiday season to everyone! Red Star is my go to yeast when I am baking. We enjoy, yeast rolls, bread & more. Thanks, for a great product that makes by baking turn out awesome. I always make yeast dinner rolls for our get together. I love making dinner rolls but also love making cinnamon rolls and bread. Really baking any bread is the best thing ever lol. Cinnamon rolls, Caramel pecan rolls, any sweet bread! The yeast recipes that I would like to make for Christmas this year are Panettone and cinnamon rolls. Looking forward to fun breads to bake with our 5yo daughter. She eats everything, so she’s just as excited as me to dive in! Maple Cinnamon Rolls look so good will have to try those for sure. I am excited to try bread recipes this year,they have always made me nervous. Pecan pie with pecans from my own tree! I’d really like to make pumpernicle and rye rolls. Yum! Looks like great book ! I would like to make some yeast rolls. I will be making a Polish Babka and some easy to make rolls. Chocolate Glazed Pumpkin Doughnuts look so good and a recipe I’d like to try. Red Star Yeast……a Holiday staple! I’m looking forward to making cinnamon buns for Christmas morning! I am going to try my hand at homemade pretzels, along with my usual holiday homemade rolls and rye bread in my bread maker. I can always depend on red star yeast for all my bread making. I’m planning on making some pumpkin cinnamon rolls. How about some of those wonderful soft melt-in-your-mouth dinner rolls. Cinnamon and Caramel Pecan rolls!! I make them for gifts every year! Plus I make the dinner rolls for all our family feasts! i typically make yeast rolls every Thanksgiving. I would love to make some sweet yeast breads for breakfast! I want to make several different kinds of bread, and make my own stuffing! Holiday and Celebration Breads in Five Minutes a Day Giveaway is just what I need for holiday cooking. We love breads and cinnamon buns. I plan to make my first Babkah at Christmas and knotted dinner rolls. Cinnamon buns for sure but excited to try new recipes. Love all bread recipes and platinum make them that much better! I plan to attempt to make various types of dinner rolls, cinnamon rolls and kolaches. Always use your products and everything comes out great! I want to make the pumpkin pull apart loaf. It looks delicious! The yeast recipes I like to make this holiday season is a couple of different flavored focaccia breads!!! I would love to make the pumpkin doughnuts for the holidays. I love to cook and love to try different recipes. This would make a nice book to add to anyone’s collection it looks like.I would like to win one. I’ll be making anything with blueberries this holiday season! I plan to make cinnamon rolls tomorrow. I love to use Red Star yeast with all my baking. I will be making home made rolls for Thanksgiving and Christmas dinners. I hope I win.!! you can never have enough dough or bread recipes,I am always looking for new ones,especially in 5 minutes.!! I always make cinnamon rolls or sticky buns and my very favorite parker house rolls. I would love to make some homemade doughnuts. love making cinnamon rolls for all my family and friends a sweet gift for christmas ! red star yeast is a great product i use to make the cinnamon dough. This looks like an amazing book! I love their other two! I love making nutella babka at the holidays. It’s a bit of an undertaking for me, because my workspace is very limited, but oh so worth it! Love Red Star fast rising yeast. Never fails me. I love to make cinnamon rolls for Thanksgiving and Christmas morning. I would make the Chocolate Glazed Pumpkin Yeast Doughnuts. I bake nut rolls every Christmas and always bake the breads and dinner rolls for Christmas dinner. This year I want to bake Vianocka, a Slovak bread since I am planning a Slovak-themed meal. Cinnamon rolls and most likely a lot of monkey bread will be made this Fall. I want to make Panetonne Bread! I would like to make my mom’s Christmas Cinnamon Rolls. I love making different breads especially for the Christmas season. I have the other 5 min books and looking forward to seeing this new Holiday and Celebration book. I’m new to baking with yeast. I want to learn how to make dinner buns for my family at Christmas. I love to make dinner rolls! They are perfect for holiday and ANY time of year! Love these 5 Minutes a Day books! I am all about making Caramel Pecan rolls for holiday breakfast and then some classic white dinner rolls for the family holiday big dinner. I’d like to make Batterway Cheese & Herb Focaccia. I would love to make some dinner rolls for Christmas dinner.